I really enjoyed this second shot story in the Nogiku series. Just like Revealed Oart One this one is told from both Mark and Jiro their point of view. 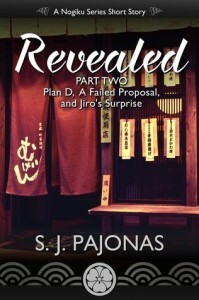 We see another side of the story then in Removed and it was so much fun to learn more about Jiro and Mark. I especially liked learning more about Mark and Lucy their relationship and how it started as there is less focus on that in Released and Removed. To conclude: This was a fun and quick short story which gives us more insight in Jiro and Mark and show their perspective during some events in Removed. I have yet to read the Nogiku series but I’m glad this novella was an enjoyable read for you, Lola. Great review! And thanks for the reminder. Do you plan on eventually reading this series? I love this series so far and Pajonas certainly is one of my favourite authors, I realy like her writing style. I am currently reading book 3 in the series and it’s so good!